This edition of our client spotlight series showcases Robin Benjamins’ website that caters to both buyers and sellers at livinginmillburn-shorthills.com. Robin gives us a fantastic example of a fully integrated IDX WordPress site that is easily navigable, content rich and loaded with social media connectivity. Robin is doing a great job of combining both our IDX plugin and mapping IDX on her site and has customized these products to achieve unique results. 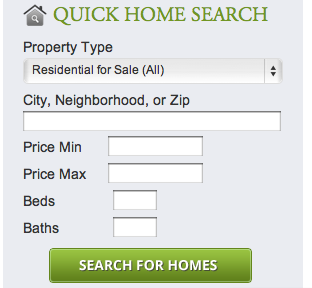 A standout on Robin’s homepage is a custom quick search module based on property type. Here, a viewer is able to narrow their search based on different types of residential properties. Once the search is defined, the results direct straight to her dsSearchAgent. The site also provides a variety of call-to-action buttons. The most noteworthy being the Login or Register widget. 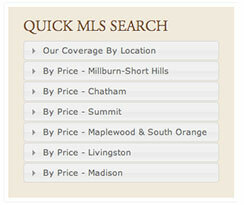 Robin is also using Diverse Solutions dsIDXPress to create search options categorized by MLS. This accordion-like drop down menu, directs viewers to the custom link structure that has customized based firstly by price and secondly by location. By constantly creating new content like this, Robin is doing her part in organically enhancing her SEO. A particular area where Robin really excels is in her social media connectivity. Her site is loaded with social media icons ranging from facebook, google+, linkedin, and youtube. She also supplements her site with regular blog posts and an area where visitors can register for her email newsletter. By providing these options, she offers the average browser a variety of content and simultaneously enhances her SEO by producing fresh content. Overall, Robin Benjamins’ site livinginmillburn-shorthills.com provides a fantastic example of a WordPress site that is maxed out with IDX integration. We hope that our client spotlight this month has also inspired you with a few new ideas for WordPress IDX integration for your real estate site and we look forward to your feedback and comments!